Remember the song, Good King Wenseslaus? It begins, “Good King Wenseslaus looked out, on the feast of Stephen.” That would be today. December 26, the day after Christmas. In her wisdom, the Church has scheduled this feast on this particular day. Yesterday we celebrated the birth of the only person ever to come down from heaven and become man. Today we remember the first person to leave earth and go to heaven as a martyr. 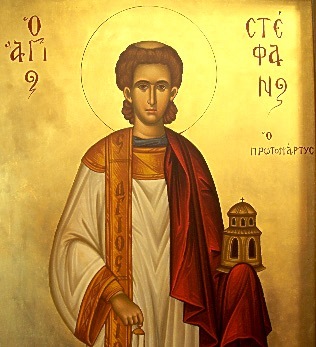 Saint Stephen is particularly important to me as he was the first deacon. The Apostles were trying to take care of everything in the new Church and they were having a hard time of it. The Greeks were grumbling that their widows weren’t being served properly. But the real lesson, I think, is that there’s no gain without risk. As disciples of Christ, we have two choices. We can remain quiet and do little to help our brothers and sisters obtain eternal life, or we can take the risk of speaking out. It’s unlikely that we’ll be stoned to death in the twenty-first century, but we still take a chance of offending someone. But isn’t that a risk we have to take?